ACTR was established in 1992 to create a network of community transportation alternatives that connect the people and places in Addison County while providing transportation services that are safe, reliable, accessible and affordable for everyone. ACTR Vermont needed a new website and fast. A lot had changed in web technology and their customers needed to be able to easily access information from their mobile devices. 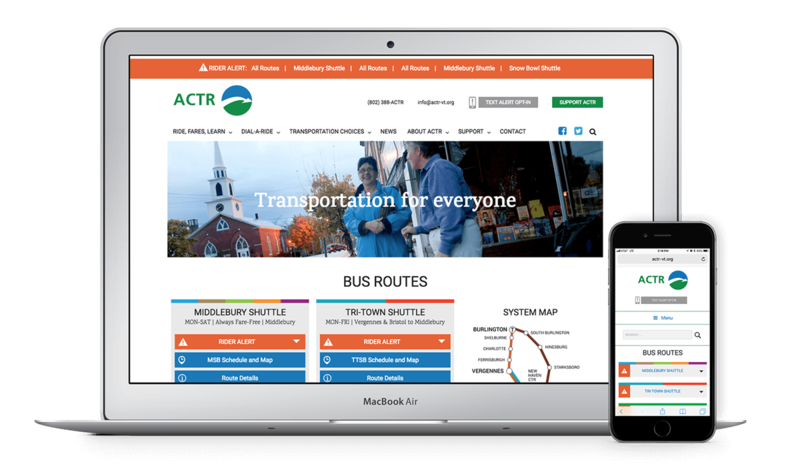 Additionally, they have a sister company, Stagecoach Transportation, that needed to use the ACTR site as a template for their Montpelier bus service. Mobile was our first priority. Such is things when you run a rural bus service. We worked carefully with their designer & stakeholders to create a site that served their ridership.